Great deal isn’t it? Saw it in the wee hours of this morning but decided to get it later, since whipping out my debit card when I’m that tired didn’t seem like a very smart idea! I’m planning to get a tub of body butter (those things smell lush! ), a cocoa moisturiser body stick, a Vitamin E range moisturiser and probably have a browse through their makeup section and get a lipstick, since I don’t own a BS one yet and this seems like a great time to try it. Post some of your shoplist ideas please, Charlotte! Just ordered, so do I receive the voucher via email and then just take it to a store?. Hope it’d recognised…. Thanks for letting me know, I’ve never used Groupon before so I was wondering how it all worked. Never used Groupon before…and now I’ve registered and tried to buy this it keeps telling me that my payment can’t be processed. I’ve checked and checked again that I’ve put my card details in correctly! Has this happened to anyone before? Will have to steal my boyfriend’s card later and do it on there! I’m sorry I’ve never experienced any payment problems before, perhaps there were too many people on the site – did you get it working? 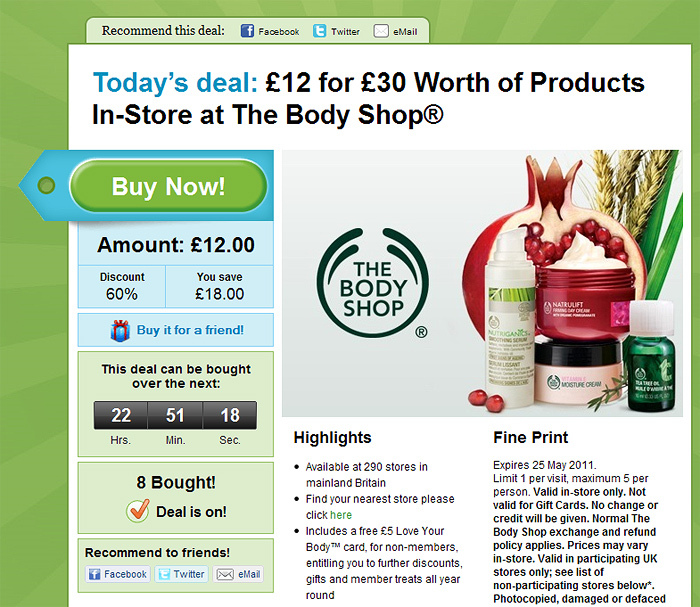 Just tried again and it’s finally worked…I can have a Body Shop spree after all!